Champagne and sundaes is a quirky combination that works. These cutting edge restaurants are a breath of fresh air. Visitors to the Turks & Caicos are always eager to sample conch and lobster, peas ’n’ rice, and tropical cocktails, things that would be hard to find in restaurants at home. But for island residents, to whom sun, sand, and seafood can actually get, well, a little monotonous, exotic often stands for urban, cutting edge, outside of the Caribbean box. We recently discovered two Providenciales eateries whose unique flavors and flair are a breath of fresh air. Sora is a chic Japanese brasserie, specializing in sushi with a French accent. Melt serves sumptuous ice cream sundaes, along with the very adult choices of coffees and champagne, among an eclectic decor that, surprisingly, appeals to all ages. 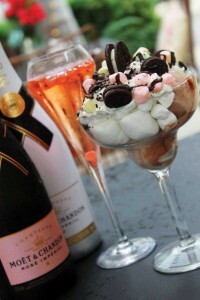 Decadent sundaes, gelato shakes, ice cream floats on the menu with . . . champagne? Rum punch? Ah ha! Now I know why all the parents flock to Melt with their kids after-school! Located in Regent Village, Melt serves a quirky combination of treats that appeal to all ages. Wildly imaginative sundaes range from traditional (hot fudge) to unusual (Nutella ice cream with peanut butter cups and hazelnuts) to healthy (yogurt ice cream with fresh berries) to utterly sinful (chocolate, hazelnut, and vanilla ice cream with a chocolate truffle, swirls of chocolate, and hazelnuts served in a chocolate cup with whipped cream). Yet also on the menu are fine coffees and a variety of select champagnes, champagne cocktails, and liquors. Decor reflects this unconventional pairing. Set around the large windows are comfortable velour sofas and lounge chairs, perfect for “chilling” and people-watching; nearby are pretty pastel kid’s play tables, with plenty of crayons, children’s books, toys, and even a carousel horse to keep the little ones occupied. It’s a contradictory combination that works, surprising even proprietor Cally Affleck who came up with the idea. She explains, “I wanted to create a place where families could come together and have fun. Everyone needs some time out of the sun, you know.” The concept appeals to both tourists and residents, encouraged by a non-stop flow of special events such as reading programs, book clubs, afternoon teas, “Teddy Bear” picnics, Open Mic for teens and Champagne ladies night (which takes place on the first Thursday of each month) for grown-ups. Cally Affleck is a woman bursting with imagination, energy, and marketing talent. She’s lived on Providenciales with her son for nine years, following a successful twenty-year career in the specialty coffee business in the UK. Her first project here was building a vacation rental villa in Leeward (Footprints on the Beach). Next, she purchased a local ice cream manufacturing business that makes a cornucopia of fun flavors on-island, supplying both the retail and resort markets. Melt was a step outside of the box that has been wildly popular. The favorites? Cally cites the Brownie Chocolate Cup, combining vanilla, chocolate, and caramel ice cream with home-baked brownies, hot fudge sauce, and whipped cream. And of the beverages? Grown-ups love a glass of Melt’s Bubbles: Champagne with strawberry caviar. Recently introduced are a line of breakfast pastries to complement the superb coffees; folks rave about such treats as Morning Buns made with croissant dough blended with cinnamon and donut muffins—is it a donut or a muffin? Local businesses can order a selection to be delivered to their offices, while some even hold their monthly meetings at Melt so they can enjoy great coffee and pastries. Ice cream cakes and made to order cupcakes are a favorite for on-site birthday parties, for the young or the young at heart! Cally enlisted the help of local art students in painting the amazing “menu wall,” along with Davidson Louis (photographer of the shots here) who also hand-painted watercolors for the printed menu, another work of art. For more information, call 649 432 1234 or visit www.facebook.com/ILoveMelt. I have to admit, I was intimidated about interviewing the owner of a “brasserie,” especially when a previous peek through the door in Grace Bay Court had revealed a sleek, modern interior that seemed more suited to Manhattan or Montreal. But two things immediately put me at ease. Besides being very much in the know about the restaurant industry, Sora’s French-Canadian owner Karl Montagne is funny, friendly, and has a natural talent for making people feel comfortable. And, who could feel out of place beside a huge photo of buffalos in traffic covering one wall and a massive stuffed buffalo head on another? This, Karl explained, is a trend in Japan—the use of a “super-awkward” element in the dining room to add perspective. And the large, light wood communal table in the center of the room is there to emphasize the sharing nature of a meal here. Sora’s menu is presented as a check-list. It describes the variety of choices, from soups and makis (sushi-like rolls) to tapas and sides. Diners select from two to three choices apiece, then share amongst themselves. Scallop Ceviche is one of many interesting menu items at Sora. Karl says the most popular makis are the Funny Maki roll (a fried sushi roll filled with red tuna, suzuki [fresh fish of the day], avocado, and basil, topped with spicy salmon) or the B-52 (a sushi roll filled with tuna, avocado, greens and . . . Rice Krispies for crunch!) Among the Japanese tapas dishes, Sake Dake stands out (layers of salmon, smoked salmon, basil, and a mushroom duxelle, wrapped in seaweed and deep fried, served with ikura dake sauce), as does Shitake Ebi (a Shitake mushroom stuffed with shrimp and mozzarella, served with tobiko cream sauce). 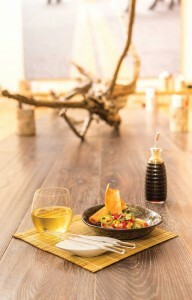 Everything is made to order by Chef Philippe at the open-air raw bar, so dining here is not a hurried affair. Karl, Manager Jamael Audette and his staff carefully pace the meal to allow for savoring and sharing, sipping sake or wine, and soaking in the trendy, eclectic vibe that fills the room. Daily specials appear on a chalkboard and are posted on the web via Instagram. Bursting with creativity, they typically incorporate ultra-fresh seafood regularly brought over from South Caicos. Karl says this has recently included deep-sea snapper, tuna, Spanish mackerel, swordfish, and butterfish. Many of the other ingredients are sourced locally as well, including chicken, quail, and quail eggs from Lignum Vitae Farm in Long Bay, an organic, environmentally friendly farm. Sora is soaring on Trip Advisor to rave reviews, as TCI visitors recognize big-city quality and service when they see it. And that suits Karl, Jonathan Daunais, and Chef Phillippe just fine. The trio brings decades of experience from Montreal’s competitive restaurant industry, along with a creative spirit backed by well-thought-out ideas and careful training of service staff. For more information, call 649 339 7672 or follow Sora Japanese Brasserie on Facebook and Instagram.